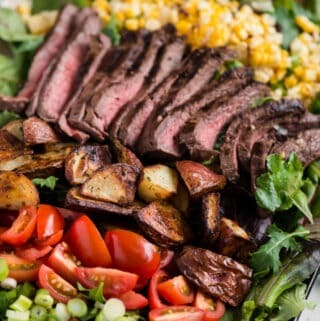 Steak Salad, made with marinated flat iron steak, roasted potatoes and corn, baby greens, and homemade ranch dressing is a delicious complete dinner recipe! This salad has everything to make a complete meal, and the flavor can’t be beat. 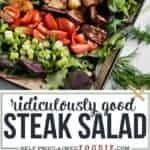 Steak salad is a great dinner option any time of year, and this recipe has a little bit of everything. I’ve been on quite the salad kick lately. Not a “diet salad”, but a “completely meal in a bowl kind of salad” kick. For a salad recipe to be a complete meal, it needs to have tons of veggies, meat, and carbs. That’s my professional opinion, anyway. 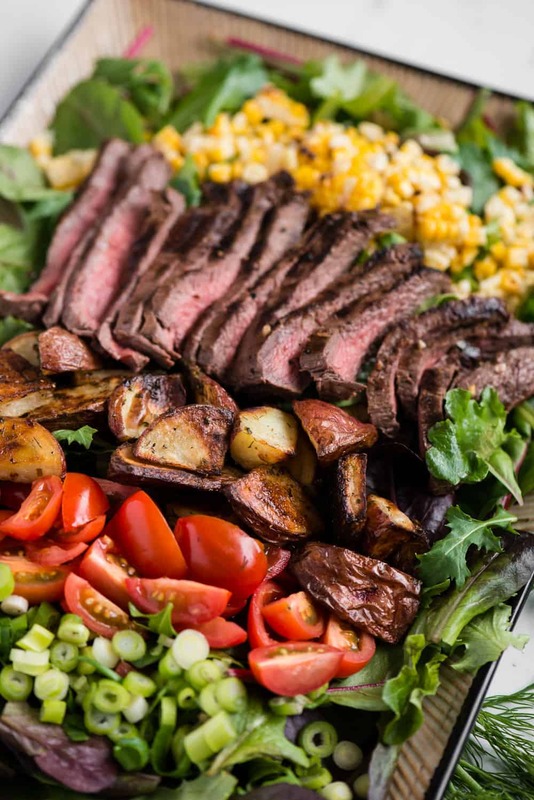 This Steak Salad recipe has it all. Tender flavorful pieces of grilled steak for the protein. Roasted potatoes for the carbs. Colorful vegetables. You can use any kind of dressing you like, but my homemade ranch dressing is phenomenal on steak salad! What steak is best for salads? I went to the store looking for flank steak to use in this salad. 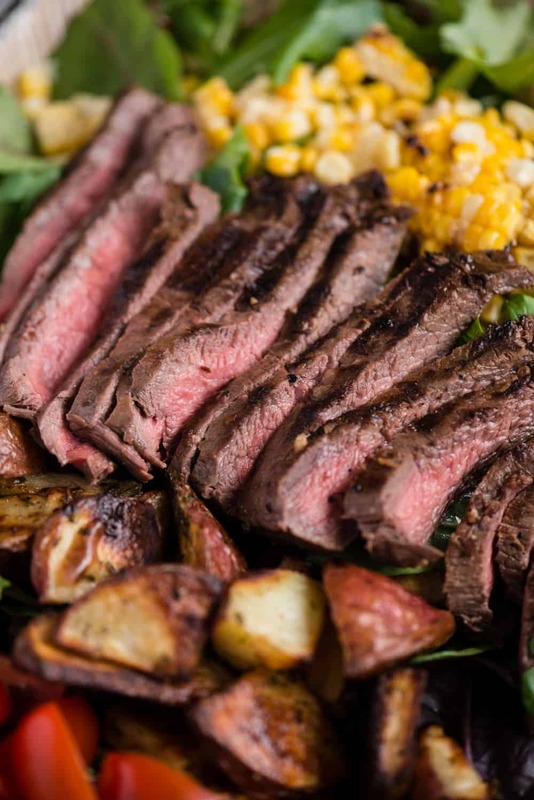 Seems like all those recipes out there that use grilled steak on salad recommend flank steak. When I got to the meat counter, the grassfed Wagyu flat iron steak was cheaper than the conventional flank steak. I asked the guy behind the counter which one was better for a steak salad and he said that he thought flat iron steak was a much better choice. He said that flat iron is the most tender cut, next to a filet mignon. I couldn’t understand why the grassfed flat iron steak was cheaper than the flank steak, if that were true. It was his opinion that at some point, flank steak became the standard to grill for things like steak salad, which is why it was more pricey. I usually always prefer grassfed meat, plus cheaper always appeals to me, so I went with the flat iron. In my opinion, the flat iron was incredible. Moist, tender, flavorful – Super YUM. Long story short, I think either flank steak or flat iron steak are great choices for a steak salad like this. You can really use any kind of steak that you prefer, whether that be filet mignon or ribeye. I would just not choose a cut of meat that requires braising. You want something that is fork tender once cooked. What dressing is good on a steak salad? You can choose any kind of dressing you like to go with this salad. 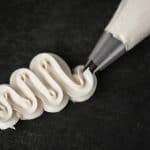 My preference is to go with something rich and creamy. Ranch dressing is what I chose when I made this salad, however a rich bleu cheese dressing or a creamy Ceasar dressing would be amazing as well. If you want to go a bit lighter, a fresh homemade vinaigrette would be a great addition to this steak salad. I would recommend something savory and tangy but would avoid anything that is overly sweet. Something like a Citrus Cumin Vinaigrette or a Lemon Vinaigrette would be fantastic with this recipe. Whatever you do, try to make your own salad dressing. The difference in quality and taste with homemade dressings is far superior to anything you’ll buy at the store. What goes in a steak salad? The options are really limitless. For it to qualify as steak salad, all you really need is some kind of steak and some vegetables. For my steak salad, I chose to start with a bed of baby greens. when I’m making a huge salad, this is the way to go because I can get a ton of organic, pre-washed baby greens at Costco for five bucks. This salad would also be amazing with butter lettuce or romaine. Almost all of my salads have green onions and tomatoes. Firm quartered cherry tomatoes are fantastic with steak, and green onions always add the right amount of flavor without being overpowering. 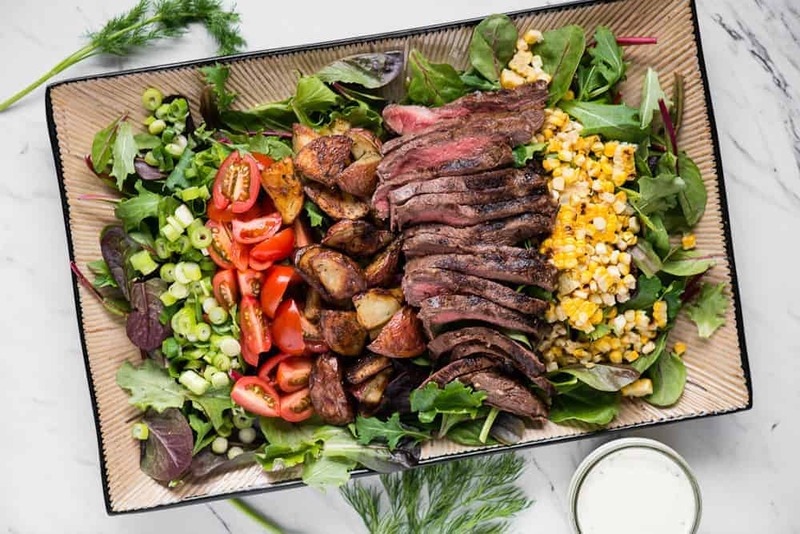 To make this steak salad really sing, I added grilled corn straight off the cob and the most flavorful roasted baby potatoes. I could eat this salad every day! As you might imagine, this steak salad is a multi-step recipe. First step is to marinate the steak. This is super simple. All you need to do is add all the marinade ingredients which is a simple mixture of olive oil, apple cider vinegar, salt, and garlic to a resealable plastic bag. Give the steak at least 2 hours to soak in the flavorful marinade, but overnight works as well. When you’re ready to make your salad, you can roast the potatoes. Again, super easy. A quick toss in some olive oil with herbs, salt and pepper and then roast in a single layer in the oven. 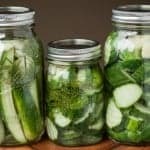 This can done right before you make the salad or you can make them ahead of time and just keep them in the refrigerator. You can roast the corn on the cob on the barbecue or a cast iron griddle. Just cook it until you get some nice char marks. When it’s cool enough to handle, you can cut the kernels away from the cob. Next step is to just chop up the green onions, tomatoes, and whatever else you want to throw on your salad. Right before you’re about to eat, grill up the steak or sear it in a hot pan. You only want to flip it once. 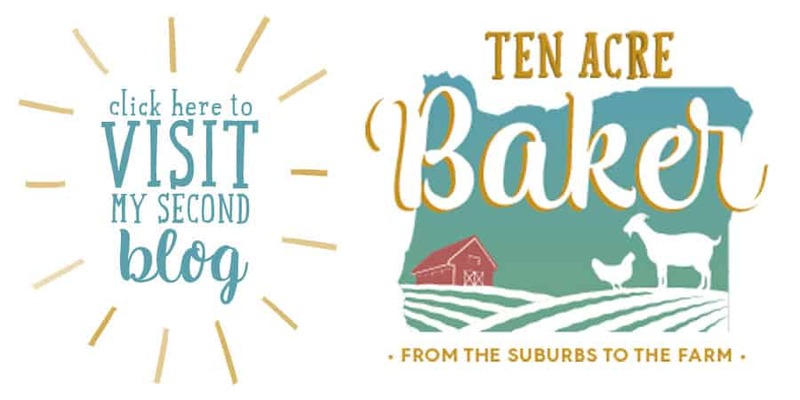 Cook it to your desired temperature and be sure to give it a good rest before you slice it. To serve, simply combine all of the ingredients with your favorite dressing and go to town! The only thing this steak salad needs is some warm garlic bread. YUM! To marinate the steak, combine all marinade ingredients in large resealable plastic bag. Add steak, squeeze out all the air, seal, and refrigerate. Marinate for at least 2 hours up to over night. To make oven roasted potatoes, combine potato wedges, olive oil, dill, parsley, chives, salt and pepper in bowl and toss to coat. Spread a single layer onto parchment lined baking sheet and bake in 400 F oven for about 1 hour, stirring occasionally to brown all edges. Roast corn on griddle or grill over high heat, turning occasionally to prevent burning and equally char. Once done, cut kernels away from cob. To grill steak, sear over high heat using a grill or griddle until you reach an internal temperature of about 130 F (for medium), turning only once after dark grill marks are achieved. Allow meat to rest on cutting board at least 10-15 minutes. Prior to serving, thinly slice against grain. To serve, either toss all salad ingredients together with dressing or arrange on platter. Goes great with garlic bread! Mmmmm, I love “meal themed” salads, and THIS sounds delicious!!! 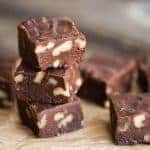 Such a delicious combination of ingredients, this is exactly what I was looking for! This salad! All the flavors in that steak is mouth watering. One of my new favorite salad recipes! So tasty. 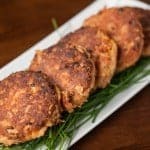 Packed with flavor and so easy! Cant wait to make this again! This is one incredible salad!! I am definitely making this for dinner!! YUM! !